The Maniacal Scientist of Lapunta (Cadence Hallborg) shares a deviant plan surrounded by his army of robots on Oct. 20 in the Missoula Children’s Theatre production of Gulliver’s Travels in space featuring Eston Composite School students. Students at Eston Composite School (ECS) have experienced the thrill of working with theatre professionals to make a play happen in only five days. Two professional director-actors from Missoula Children’s Theatre helped a group of students from ECS to learn and present a theatrical version of Gulliver’s Travels with a twist. The play was basically Gulliver’s Travels in space, a play conceived and written by Michael McGill. 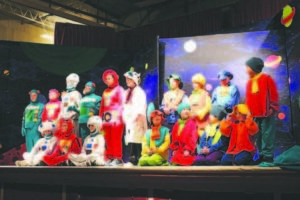 It was not only a play because it was a musical and the actors performed their song and dance over two days including an evening performance on Oct. 19 and an afternoon performance on Oct. 20 in the school’s gymnasium. Professionals with Missoula Children’s Theatre also made stops in Kyle and Burstall in the region this year. People attending the play on either day enjoyed dessert and refreshments before the performance, and then people made their way to the seats to be dazzled by colourful costumes and an enthusiastic group of actors. The play ran for a little more than an hour. Missoula Children’s Theatre professionals travel to schools across North America and about 15 other countries to work with students for five days to make the play happen. The students have to audition for the play on a Monday, and then they are assigned parts and given a practice schedule for the week.